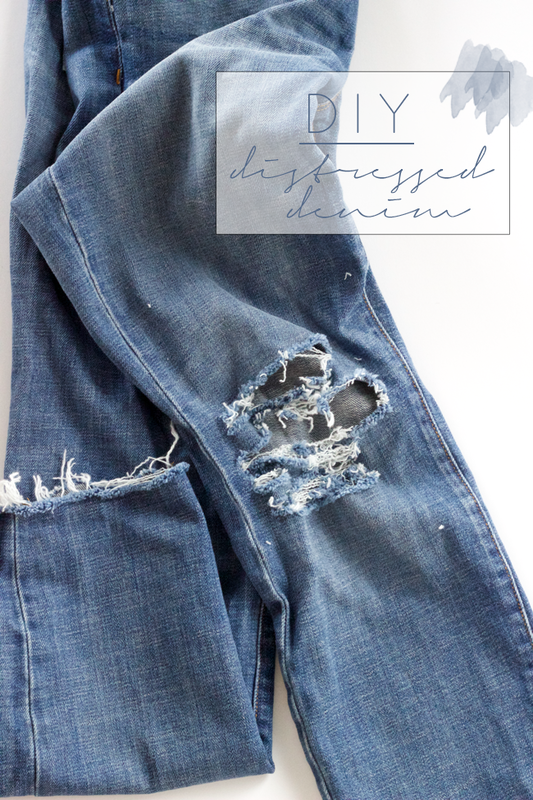 I’ve become pretty obsessed with distressed denim and almost exclusively wear jeans that are distressed in some way. I had a non-distressed pair that has been sitting in the back of my closet for months without wear and decided to DIY them so that I would want to wear the more often. With the pants on, use a pen or a piece of chalk (if you happen to have that laying around) to mark where your knees hit. If you also want to raise the hemline, mark where you should cut the legs. I like the bottom to hit right at my ankle bone. 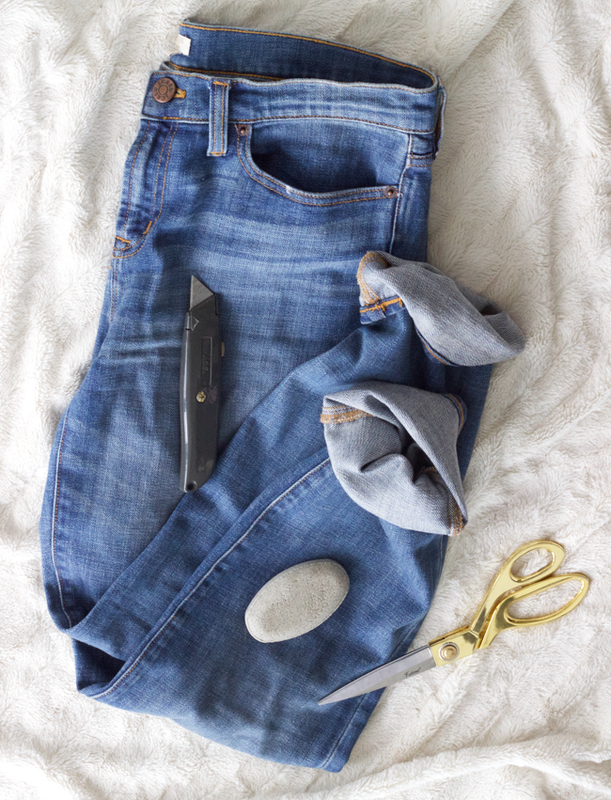 With the pants off, use an exacto knife or sharp scissors to make slits in the knees. Be sure to put a magazine or a piece of cardboard inside the pant leg so you don’t cut through both side of the jeans. I’ve in advertently had to make a few pairs of cutoffs this way. Make the longest cut the width of the middle of the knee. Above and below that point, alternate long and short cuts. Repeat this on both legs (obviously). Don’t pull any of the fibers. 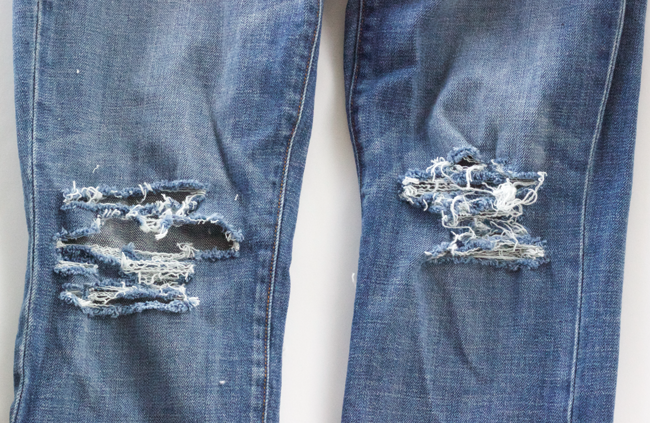 Don’t forget about distressing other parts of the pant. Using the exacto knife and pumice stone to distress the pocket line, the upper thigh, and back pocket. The pumice stone will thin the denim whereas the knife will actually cut through. Use the pumice stone in small circles to distress the pockets. Use the exacto knife to make small nicks in the thigh and on the back pockets. Trim the bottom of your pants right below the link you marked near your ankles. It’s crucial to cut below the line so that if they shrink in the wash they don’t become shorter than you anticipated. This also acts a safety net in case you cut unevenly and need to trim one leg to match the other. Wash and dry your jeans. Trim the extra fibers. In the picture above, I’ve only trimmed the fibers on the left pant leg so you can see on the right leg how they will come out of the dryer. Repeat the process if you want more distressing. This is totally on my weekend to do list. Thanks for sharing a great DIY. Thanks for sharing this!! I have to try this out. They turned out so good!